From Director Ridley Scott ~ the man who brought us such Science fiction trailblazers as BLADE RUNNER, ALIEN, & PROMETHIUS comes a space and time continuum for the ages, as we venture into his next great adventure with ~ THE MARTIAN. Facing the tragedy head on, NASA Chief Officer Teddy Sanders (Jeff Daniels) delivers the bad news to the nation, and his team ~ including Vincent Kapoor (Chiwetel Ejiofor), Annie Montrose (Kristen Wiig) and Mitch Henderson (Sean Bean), that Watney has perished…. But, wait a minute…not so fast… as an Injured, but still breathing Watney finds himself suddenly stranded on this desolate planet. 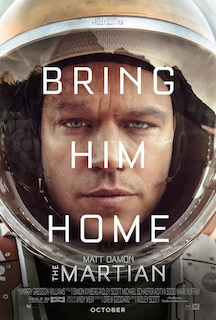 Quickly Watney comes to the realization that he must muster all of the strength and brainpower he has, in order to find a way to reach NASA, and to keep himself ALIVE!! !